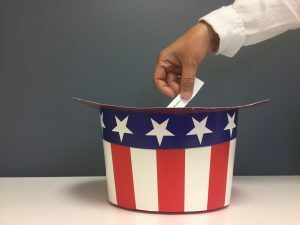 PORTLAND, Ore. — Healthy Democracy, a nonprofit nonpartisan organization that pioneered the Citizens’ Initiative Review, will be holding a public event to randomly select a group of registered voters from Multnomah, Clackamas and Washington counties to serve on a review panel to examine the Metro Region Affordable Housing Bond Measure that voters will be asked to vote on in November. The Citizens’ Initiative Review, or CIR, will bring together a cross-section of voters who are randomly selected to match the demographics of the metro region in key areas such as political affiliation, race and ethnicity, age, gender and education. The 20 citizen panelists will hear from subject matter experts and proponents and opponents of the bond measure and have the opportunity to ask questions and deliberate among themselves about the information they are receiving. Advocates for and against the measure will have the opportunity to provide information to the citizen panel by submitting written statements and testifying in person. At the conclusion of the review, the panel will produce a Citizens’ Statement to give voters key facts about the bond measure and the best arguments for and against its passage. The review will take place from August 23-26 at the University of Oregon’s White Stag Block campus in downtown Portland. Members of the public and media are invited to observe at any time. 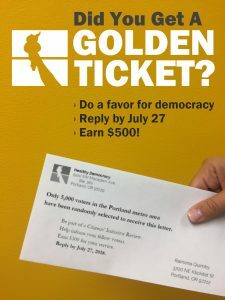 Earlier this month, 5,000 randomly selected voters received a mailing inviting them to participate as a citizen panelist. Of those who responded, a public meeting will be held to randomly select the 20 among them who will be seated on the review panel. The CIR Panelist Selection event will be held on Thursday, August 2 from Noon to 1:15 p.m. at the US Bank room in Portland’s Central Library. The public is invited to attend to learn more about the CIR and witness the final panelist selection process. For more information, please see the CIR announcement here.